For those of you twiddling your thumbs awaiting Sean Dunne’s statement of financial affairs, you won’t have much longer to wait. Sean has sought, and has been granted, a second extension to the deadline to file his financial statements, and the revised deadline is this coming Thursday, 2nd May 2013. The Bankruptcy court has today agreed the new extension. The application and order are available here, and an extract is shown above. This doesn’t look good for NAMA, at all, and particularly just a few days after businessman and developer Paddy McKillen launched a High Court action against NAMA alleging breach of privacy and confidentiality. In a separate case entirely, NAMA is suing Tipperary businessman John Fraher. Today in the High Court, the redoubtable Judge Peter Kelly entered judgment against John for €5,508,983. Sadly for John, there’s nothing exceptional about it, he owes the money and hasn’t paid it, and he has now filed for bankruptcy in the UK with a hearing scheduled for 17th May 2013. What is exceptional is that John’s affidavit reveals evidence that NAMA is sharing, or at least shared in John’s case, details of loans owing by people connected to John, but also people unconnected to John directly but merely connected to borrowers who are in turn connected to John. Not just that, but NAMA seemingly disclosed not just the par value or nominal value of the loans but the value at which the loans were acquired by the Agency. John claims the details were given by an employee of NAMA, Padraig Reidy, to John’s financial advisers. In his affidavit, John claims that since these proceedings have started (in January 2013) NAMA has been in touch with John’s financial advisers “asking that they destroy” the loans listing. John appears surprised that he was given a listing of loans which includes “individuals and entities with which [he has] no connection whatsoever and with whom [he has] no joint or several liability to NAMA”. The co-borrowers include Jack Ronan, the pantomime villain in the Vita Cortex production which saw 50 staff stage sit-ins at the Cork Vita Cortex factory for nearly six months when there was an apparent reneging on a redundancy deal. According to John’s affidavit, John says he believes the loans to a company called “Vita Five” relate to the Vita Cortex business. John is unhappy because the Vita Cortex workers picketed the Poppyfield Retail Park in Clonmel in an apparent attempt to put pressure on Jack Ronan to stump up the reneged-on redundancy payments. John apparently co-owns the Poppyfield property with Jack and says that the picket affected business there, which was no fault of his. John is also unhappy with what he claims was NAMA’s focus on other borrowers in his connection to his sidelining and exclusion. John claims he offered to settle his own loans to NAMA in July 2012 and claims the offer would have produced a surplus for NAMA – presumably by reference to NAMA’s acquisition values which it bizarrely revealed to John – but says John, “said offer was refused out of hand and without any negotiation as it did not deal with his” co-borrowings. John complains that at NAMA’s behest, there were two receivership appointments relating to the Poppyfield property; in the first instance NAMA had receivers appointed to tenants and then it had the same receivers appointed to the landlord, which in John’s view results in a conflict of interest. John goes to some lengths in his affidavit to demonstrate that he tried to work constructively with NAMA, pay back his own exclusive loans and considered other options before finally plumbing for UK bankruptcy. He disputes that he owns the “brand new Porsche” which NAMA’s process servers say they found in John’s parking space at his Gerrard’s Cross apartment block. With respect to his liabilities, John says that NAMA’s delays with dealing with the properties has led to a devaluation, and he is also unhappy that despite being severally liable with his co-borrowers, he claims, NAMA has only pursued him. The affidavit provides John’s side of the story only of course, and you should bear that in mind when considering the above. NAMA was asked for comment on the affidavit at 7.30pm this evening and at time of writing there has not been any response. On the face of it, this is serious for NAMA because the Agency has seemingly provided details of acquired loans with par and NAMA values, but more seriously it has listed sums due by third parties unconnected to the debtor. The affidavit is here but the attached table is being withheld for the time being until privacy issues are more fully considered. Recently on here, we looked at the annual report of AIB UK Loan Management Limited, which is the NAMA-like unit in AIB in the UK and which manages €5bn of loans compared with NAMA’s €74bn. There is a remarkable contrast between AIB’s accounts and NAMA’s with the latter swamped with foreign exchange gains and losses and revaluations of derivatives. NAMA’s accounts are difficult enough to analyse in the first place with profit overstated by what appeared in the past to be overly optimistic accounting for interest income and impairments but understated by not including profit on disposals until a debtor connection is closed. I know this will sound convoluted to many of you, but suffice to say it is difficult for an accountant to evaluate NAMA’s financial performance. But let’s try. Last week, NAMA published its unaudited accounts for 2012. We expect to get the audited accounts in June 2013, and in previous years the loss on impairments has leapt between the unaudited accounts and the final version. In 2011 for example, the impairment loss went from €800m in the unaudited accounts to €1,267m in the final audited accounts published in July 2012. In a parliamentary response last week, Minister Noonan said NAMA’s report would be published “in the next two months” so that would indicate June 2013, which means we might see NAMA questioned in the Oireachtas before TDs and senators repair to the beach. (2) Revenue. NAMA generated €1,387m in revenue in 2012, mostly interest on its loans. This compares to €1,283m in 2011. There was an increase in interest income despite the ECB trimming its main rate to 0.75% in July 2012. NAMA says that 100% of its interest income booked on its loans was received in cash. For those of you who followed the “Effective Interest Rate” saga on here before, that might give you some confidence that NAMA is not over-optimistically booking fantasy income. NAMA’s loans fell from €25.6bn in 2011 to €22.7bn at the end of 2012. And it is not immediately obvious on here why interest income increased in all these circumstances. (3) Costs. NAMA created bonds in 2010 to buy the €74bn of loans from the banks. NAMA paid the banks €32bn for the loans with these bonds. Since 2010, NAMA has redeemed €4.75bn of these bonds using cash generated in its business. The interest charges in NAMA fell in 2012 to €496m from €512m in 2011. NAMA’s admin expenses in 2012 came to €119m compared to €128m in 2011 with the main reason for the decrease being “portfolio management fees” reducing from €16m in 2011 to €5m in 2012 – now these should be receiver costs but NAMA tells us that receiver costs are charged to the companies in which the receivers operate so it is unclear what these costs are. (4) Cash. At the end of 2012, NAMA had €3.4bn on hand compared with €3.3bn at the end of 2011. NAMA has recently been required by Minister for Finance Michael Noonan to make up to €1bn of credit available to the special liquidation of IBRC, though that should be repaid. And NAMA is required to redeem another €2.75bn in bonds by the end of 2013 – which, with the €4.75bn redeemed to date will bring total redemptions to €7.5bn – because Minister Noonan unilaterally gave that commitment to the bailout Troika last year. NAMA is still generating significant cash so there should not be any immediate concern about its ability to provide investment funding in its projects. (5) Impairments. NAMA estimated the value of its loans fell by €518m last year, compared with €1,267m in 2011. Both Irish residential and commercial property declined by 5-6% in 2012, which was less of a decline than previous years. UK commercial property fell 4% and residential property was flat. There is not a perfect correlation between property prices and impairment but there is a relationship and the smaller impairment might reflect a lower rate of decline, but the betting on here is the audited impairment will be around €700m. (6) Salaries. Given the expected interest, you might have expected NAMA to produce salary costs and employee numbers but no, all we have is that NAMA paid the NTMA €36,890,000 in 2012 and the assumption in here is all of that related to staff costs for what would have been about 250 at year end. So very roughly, the average staff cost would be €147,560 which would include employer pension and PRSI costs. (7) Disposals of loans and property. NAMA says it disposed of €2.8bn of assets in 2012. In 2011, NAMA “approved” disposals of €5.6bn but it says it did not sell any loans during that year. 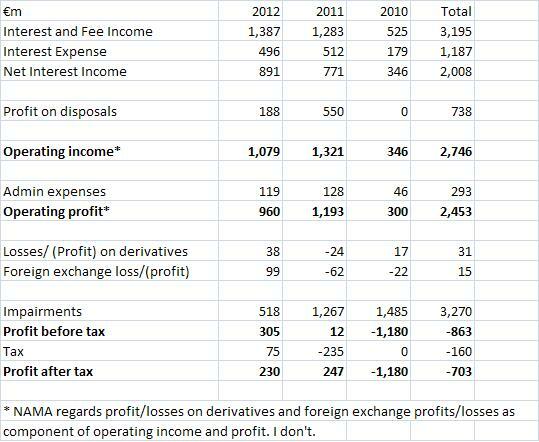 NAMA booked only €188m profit on disposals in 2012 compared to €550m in 2011. NAMA hasn’t indicated what the unrealized profit reserve was at the end of December 2012, remember that NAMA has an accounting policy of not recognizing profits on disposals until all of a specific developers loans are sold/refinanced/repaid. (8) Non-performing loans were 82% by reference to par value (NAMA acquired €74bn of par value loans and paid €32bn for them). Although this is up from 80% at the end of 2011, it is the same as the previous quarter, which given that NAMA is disposing of what are widely perceived to be the better quality loans is impressive, if correct. However we don’t know the non-performing loans by reference to the original loan agreement and in the previous quarter these were 15%, so NAMA might be masking the deterioration by negotiating new terms and then classifying the loan as performing under the new terms. (9) NAMA advanced €308m to borrowers in 2012 compared to €304m in 2011. NAMA says it has approved €1.7bn of advances to borrowers so far, but it not exactly clear where NAMA gets the figures to support its claim that it has advanced €1bn to date to its borrowers with the evidence being that it advanced €240m in 2010, €304m in 2011 and €308m in 2012. When analyzing the accounts for 2012, one thing did strike me – we live in a society agonizing with the effects of the financial crisis, looking for people and companies to blame, and awaiting with trepidation the next dose of bad news; what struck me is that NAMA did quite well in 2012. Here is a brand-new agency of 250 people generating income of €1.4bn, which has a healthy cash balance and apart from the Enda Farrell affair has largely escaped scandal. Here is a company which generated €300m of pre-tax profits and certainly kept its costs within budget. It won its battle in London against Paddy McKillen, and kept its nose clean in a country where political interference is rife. There is not very much detail in the management accounts and we await the annual report which appears to be scheduled for publication in June 2013. Has Sean Dunne told US courts his current address? When the KNWL helicopter visited 526 Indian Field Road, Greenwich, Connecticut CT 06830 on 17th April, 2013, there didn’t appear to be anyone at home, and subsequent enquiries indicated that the Dunnes had upped-sticks and moved to another house in the neighbourhood. It seems though that the bankruptcy court still believes the Dunnes to be resident at 526 Indian Field Road because that is the address that notice was sent by the bankruptcy court yesterday (Sunday, 28th April 2013). The notice is partially reproduced above and the full notice is available here. We don’t know what the notice issued by the court was. We are awaiting Sean’s statement of financial affairs which was supposed to have been filed with the court by last Saturday 27th April, 2013 after an extension was previously obtained. As of 3pm Dublin time today, there is no such filing available from the US court service, PACER. 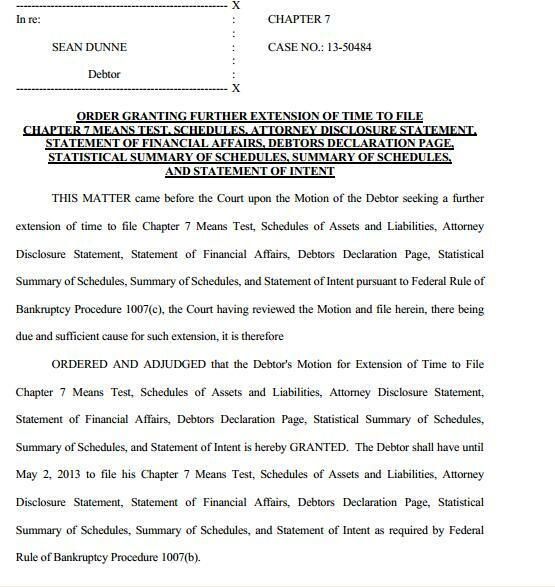 The certificate of notice which was filed on the US court service today also indicates that several parties including NAMA and Sean’s bankruptcy lawyer were sent unspecified notices. This is potentially important because the US courts tend to be strict about addresses provided in bankruptcy cases, though there doesn’t appear to be any doubt that on 29th March 2013, when Sean originally filed for bankruptcy he was still at 526 Indian Field Road, but where is he now? It isn’t surprising to see the clarification and apology in the “story of what have you” the Irish Times this morning, following that newspaper’s reporting of the NAMA report issued last week. The Irish Times today says sorry to Ronan King, the accountant formerly at BDO and at the helm of Property Industry Ireland. In fact what the NAMA report said was that it had initiated a case against Ronan in Q4,2012 and that the relief sought by NAMA was “judgment in the amount of €559,700.71”. The case hasn’t yet come before the courts, as far as I can see from the Court Service, so it was premature of the Irish Times to claim that judgment had been obtained. This morning, the newspaper says sorry. Mind you, it remains unclear why the Irish Times is today saying “Nama (sic) has not applied for judgment against Mr King” because the NAMA report indicates that it has sought a judgment. NAMA was asked for comment on the apparent inconsistency but there has not been a response at time of writing. It’s been just over a year since Minister for Finance Michael Noonan created a strange new species, the NAMA advisory board which is completely separated from NAMA and which reports directly to the Minister. It has three members – pictured above. The board comprises Michael Geoghegan, the former boss at HSBC whose role at the bank came in for some criticism last year by the US Senate investigation of money-laundering at HSBC, an investigation which resulted in a fine of USD 1.9bn in December 2012. The other two board members are NAMA’s own chairman, Frank Daly and Northern Ireland quango king, Denis Rooney. Last week, in the Dail, Minister Noonan was asked about the activity of the NAMA advisory group in the past year. Minister Noonan confirmed that it has met five times to date. Remember the three members don’t get paid but the board has an annual budget of €40,000 for expenses. We don’t learn anything about what the board has actually achieved in the past year, it was previously reported to have said “NAMA has overcome difficulties and is an effective organisation” Minister Noonan said he is satisfied the NAMA advisory boad “is working effectively and with the progress to date”. The view on here is that if you ever want to see a superfluous quango at work, take a look at the NAMA advisory board. The parliamentary questions and response are here. Deputy Pearse Doherty: To ask the Minister for Finance if he will outline the activity over the past year of the National Asset Management Agency Advisory Board comprising persons (details supplied); and if he will outline any recommendations made by that board to him and the subsequent treatment of any such recommendations. Deputy Pearse Doherty: To ask the Minister for Finance if he will provide an assessment of the utility over the past year of the National Asset Management Agency Advisory Board comprising persons (details supplied). Minister for Finance, Michael Noonan: I propose to take questions 222 and 223 together. I met with the group on four occasions in 2012 and once to date in 2013. It is also open to the Chair to contact me as issues arise. The group’s advice to me primarily relates to the strategy of NAMA as proposed by the board of NAMA; the remuneration of the senior executives of NAMA and any further advice that I may seek on any matter relating to NAMA. The group operates on an informal basis and reports directly to me. Any issues raised are discussed with senior officials within my Department. The advisory group plays a valuable role and I am satisfied it is working effectively and with the progress to date. However it is important to note that this group is not a shadow Board nor is it intended to provide a route for me as Minister to get involved in the day to day running of the Agency.